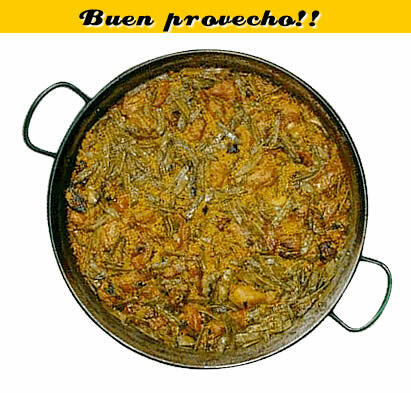 Paella Valenciana recipe – English | LaPaella.net – Receta de la Paella Valenciana, Paella de marisco y otros arroces típicos. One tablespoon (not too crowded) of ground paprika. 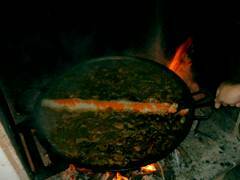 Ferraura, rotjet or wide green bean (400 g.). White beans or tabella (100 g.). 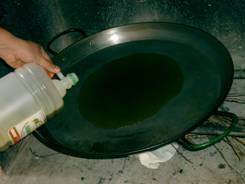 Pour the oil in the middle of the paella, the size up our, we light the fire and heat the oil. 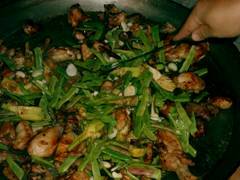 When the oil begins to smoke, we added the chicken and rabbit sliced ​​and lightly salted, browning carefully over medium heat. 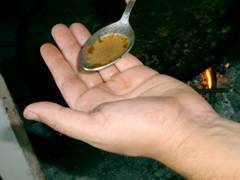 If the fire is excessive, we sprinkle a little salt on the rim of the pan, in those areas where no oil to prevent burning. 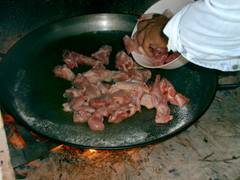 It is important that all meat is well browned, paella success depends a lot on this stage of processing. Add the chopped vegetables and sauté a few minutes. 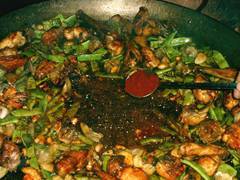 We make a hole in the center of the pan aside the meat and vegetables. In this gap we incorporate the tomato, fry a few minutes and add the paprika. We let cook another minute. 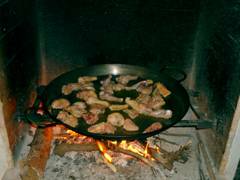 It is important that the fire is smooth in time to put the paprika, as we run the risk of burn and be bitter paella. 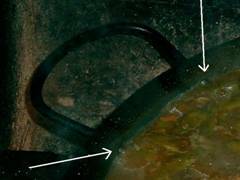 It’s time to pour water close to the edge, as shown in the photograph on the left. Add some salt and cook for about 20 minutes, adding more water if necessary. After 20 minutes, we must ensure that the stock of the paella comes right up to half of the rivets on the handles, as indicated by the arrows in the picture. Next, we tested salt. 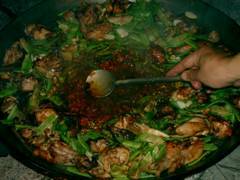 The broth should be very tasty, slightly salty because the rice during cooking, it will absorb some of the salt. It’s a good idea to try the stock one of the guests. 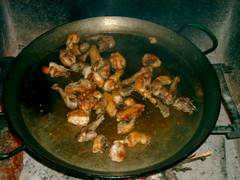 If finally the paella out soda or salt can blame the gullible that tasted. This is the time of incorporating the rice. If we have correctly taken the reference of the rivets on the handles, simply by making a groove with the rice sticking out an inch on the stock, we will have achieved the perfect ratio of rice and broth to the pan in which we are cooking. That is the exact size you need rice paella. 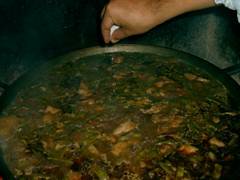 If we add more rice, we raise the level of the broth, adding water, but we’ll be forcing the liquid-rice to the paella. 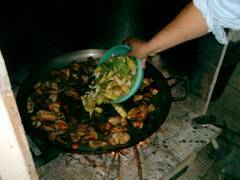 Ideally, use a larger diameter paella. All these references are approximate. The hardness of water, fire power, variety of rice and even the altitude change to a greater or lesser degree liquid-rice ratios we use for each container. However, I hope this short explanation will serve to help the most inexperienced. Add saffron or dye on rice, to prevent the occurrence of lumps of dye that is formed when this product is of poor quality. 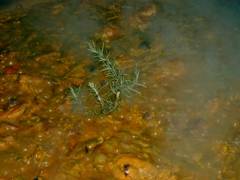 With saffron never have this problem and we can incorporate it into the pan as we deem appropriate (in strands, roasted, ground, diluted …). 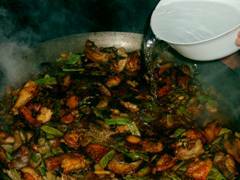 Uniformly mix the rice in the bowl and try that rice grains are not on the meat or vegetables without being submerged in the broth. 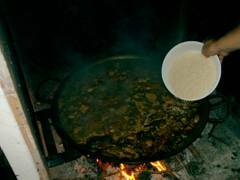 We cook over very strong for 7 minutes, or until half cooked rice begins to appear, as shown in the photo on the right. 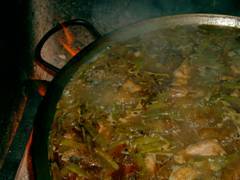 At this time we lower the heat almost to a minimum and cook another 4 to 5 minutes, avoiding the starch which has been releasing the rice during cooking and thicken the broth has ido, burn and grip the bottom of paella. It is also time to put over a couple of sprigs of rosemary (fresh if possible), but it is optional and taste of each. After 5 or 6 minutes if the paella has nothing or very little of broth, let cook for the last 3 or 4 minutes over very, very soft. 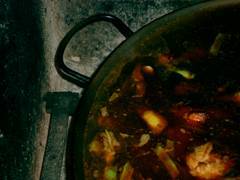 If you still have a lot of paella broth, these 3 or 4 minutes late would cook with the medium. 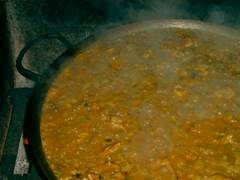 But better something soupy paella with rice or honeyed at its cooking, but with a dry rice or pasty and burned. 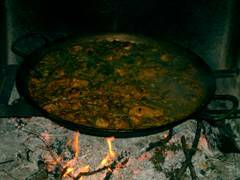 In short, we cook paella in total between 14 and 16 minutes, first full 7 minutes, then 4 to 5 minutes over low heat and the last 3 or 4 minutes over low heat or medium heat, depending on the stock we have left in the container. In Tips and Tricks section for more on this topic. 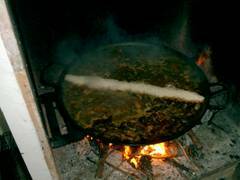 In Valencia it is customary to rest the paella. 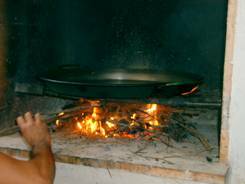 It is important to know that after removal of the fire, if hunger does not stop us, wait 5 minutes before serving paella rice helps the end and finish cooking broth absorption may still be, the rest usually sit very well to the paella, especially if they’ve been a little harsh. And here’s the result … The Valencian paella.